I have to admit, I've been a fan of old school role-playing games (RPGs) ever since I got hooked on Final Fantasy II (that's FF IV, in Japan) on the Super Nintendo Entertainment System. I've played all sorts of RPGs on all sorts of systems since then, but nothing makes me more content than a top-down RPG featuring a twisty storyline, super-deformed characters, and music that is so good, it will have you buying every single soundtrack you can track down related to the game. Today, CD-quality soundtracks and full-motion video (FMV) are standard features in video games, but long ago, in a time predating even the SNES, this was not so. Back when I first saw the Ys (which sounds like "geese" without the g) games on NEC TurboGrafx 16, I was blown away. The TurboGrafx 16 was among the first few consoles to boast a CD-ROM drive, which enabled the developers of Ys to pack a few minutes of anime-style FMV and some incredible music. The music for the series (still available to this day) is so good that I continue to include it on new Minidisc mixes for my car stereo. I haven't yet been able to grab a TurboGrafx console, but I did snag Ys III when it came out for the SNES. Of course, that title is considered to be one of the worst Ys games ever produced. Luckily for the Japanese, Falcom of Japan recovered nicely with the release of Ys IV, which swiftly climbed to the top of the sales charts challenging even the ever-dominant Final Fantasy series. Sadly, I haven't seen a legal copy of the game in English...yet. But there's always hope that there may one day be a Falcom "Greatest Hits" collection. So, what does all of this have to do with the anime series, Ys? Essentially, it's the animated version of the super popular Ys IV, and it would not exist if it didn't have a successful video game backing it up. Our story begins on the island of Esteria, known in ancient times as the great civilization of Ys. As frequently happens in fantasy adventures, an old evil is rising once again, threatening all life on Esteria. As a wandering warrior in search of a purpose, Adol Christin desires to leave the safety of the mainland and head for Esteria. When he arrives to the port town of Promarock, he checks out the nearest inn (to save his game and restore his health, of course) and gathers information on the voyage to Esteria. As it turns out, due to some evil magical force, all trade to and from Esteria has ceased. Not about to be turned away from his destiny, Adol gets help from one of Promarock's shipmasters, Mr. Norton, who bears more than a striking resemblance to Mr. Clean. Coincidence? I think not. Anyway, since he's such a nice fellow, and Adol reminds him of himself in years past, Mr. Norton agrees to train the brave young lad in the ways of seafaring. He enlists Adol in his work crew, and after carrying heavy things around and loading and unloading ships in a brief training sequence, Adol has learned everything he needs to know about the sea. As a graduation gift (or a convenient way to remove evidence of unpaid employees), Mr. Norton gives Adol a small ship and a bag and tells him he's ready to leave for Esteria. Though Adol's surprisingly skillful at handling a small ship, he is no match for the mystical vortex that isolates the island from its neighbors, and only his fate and luck get him to Esteria alive. 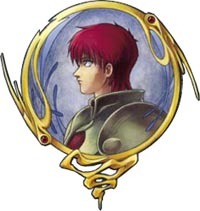 Eventually, we discover that Adol is the "Legendary Brave Soul," one destined to rescue Esteria from the dark grasp of the beasts running amok throughout the land. He is swiftly identified and pushed into a quest that will help him fulfill his destiny, so long as he can survive. For the most part, it's not hard to predict how the show is going to unfold. After all, it follows many classic conventions of older RPGs. That means that the action of the series can be broken down into three primary parts. One, expanded quite a bit since this is an anime title and not a game, is the storytelling aspect. That's where characters interact and the plot is advanced, letting us know what Adol's going to do next and why. The second part of the show is the questing scenes, where Adol (and whomever may be with him) travels the land fighting tons of easily dispatched monsters as he heads somewhere useful. Finally, there are the boss battles, scenes dominated by terribly powerful magical creatures that usually guard an artifact Adol needs to complete his task. While this is probably going to be a structurally simplistic show, it promises a good dose of pleasant nostalgia for all of us who've grown up playing 8- and 16-bit video games. And, for those of you who haven't, this show should present a small taste of what we had back in the day. Our hero, the red-haired youth from a far away land. He's tossed into the fray rather swiftly, declared to be the legendary brave soul foretold by prophecy. The latest in a long line of fortunetellers, her family has predicted the coming of the legendary brave soul that will rescue Ys from darkness. The stout protector of Sarah's town, Slaugh becomes a quick friend of Adol's. A good-hearted thief, he was one of the men that rescued Adol after he was washed up on the shores of Esteria. Discovered in a temple while Adol was searching for the first Book of Ys, Feena, like Leah, has no recollection of her past. She, too most likely has a significant destiny concerning the fate of Esteria. A young girl who cannot recall her past, Leah turns out to have the ability to read Sarah's crystal ball.